Calling it the March of Return is in itself problematic, embodying the Palestinian claim of a “right of return” for generations of refugees and their descendants emanating from the 1948 Israeli war of independence/Palestinian Nakba (catastrophe). Even if totally peaceful in practice (i.e., not accompanied by firebombs, rock slingers and burning tires as they are) this is understandably viewed as an existential threat to their country by most Israelis, with a mass of people demanding access– more or less literally– to Israeli towns and homes. I feel sick about what is happening in Gaza. I’ve read all the justifications for why Israeli forces have to use live fire, about how Hamas is using a civilian protest to try to get terrorists to the border to enter Israel and attack Israelis (which may be true, at least in part), about how all the Palestinians demonstrating at the border are terrorists. What do Palestinians themselves say? Do we automatically think that everything the IDF spokesperson’s office says is true? And, they aren’t all terrorists. 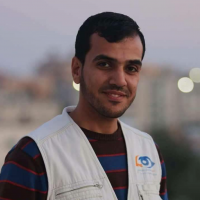 One non-terrorist was shot and injured today, and then died of his wounds — a Palestinian journalist, a photographer named Yasser Mourthaja [pictured above]. He was wearing a vest that had PRESS printed on it. In response, it was pointed out that Mourthaja (claimed by Israel’s Defense Minister Avigdor Lieberman to be a Hamas officer) was heading toward the border fence for a closer look, to where he would be obscured by the smoke of burning tires, a smokescreen that covers Palestinians attacking the fence with firebombs or other means. To make this more complicated, if Israeli soldiers are authorized to fire at Gazans very close to the fence where their vision is obscured by smoke, they would not be able to clearly identify who they are shooting at. So is the shooting justified? To make matters worse in the past few days, a video was released on the Internet showing an Israeli sniper shooting a man across the line who was simply standing on the Gaza side, and then crudely rejoicing over the hit with his IDF comrades as if this were a game. Most people believe this occurred during the latest round of demonstrations, but it may have happened another time, because the scene depicted is quiet, with few people in view and no evidence of smoke or other signs of a mass demonstration. In either case, this shows what appears to be a case of murder.